If you grew up dying eggs for Easter, you've no doubt used or at least seen those boxed kits that turn your eggs neon colors. Admittedly, they're easy—just plop a dye tablet into some water, dunk the eggs, and wait for them to dry. But the one thing a lot of people don't think about is where that dye comes from. With names like FD&C Blue 1 and Citrus Red 2, the ingredients in store-bought versions are ambiguous at best, and even FDA-certified food colorings are made from petroleum. If you're trying to cut chemicals out of your life, there's a lot more to think about than just replacing your bleach with vinegar. You can make your own super simple dyes using inexpensive, natural ingredients. You can use easy-to-find, natural ingredients to make just about any color for your eggs. Because they aren't as intense as the store-bought kind, they do require soaking for longer (up to overnight), but at least you won't be messing with a bunch of chemicals! For most colors, you'll start with a cup of boiling water with a teaspoon of vinegar, then add another ingredient for color. A few of them skip the extra step by starting with a liquid that's already got the hue you're looking for. Here are some examples of vegetables and spices you can use to make all your basic colors. The colors that most of these yield will depend a lot on how long you steep or boil the dying agent, and, of course, how long you soak the eggs in the dye. To make them darker, you can add alum powder, a pickling spice which you can find in most grocery stores. Cooking the eggs in the dye rather than boiling them beforehand will also make the colors more intense. For more ideas, check out this huge list of plants that can be used for natural dyes (and how to use them). 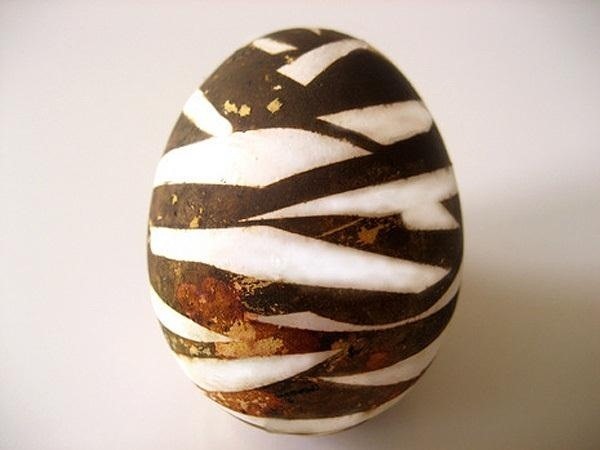 If plain, solid-colored eggs bore you, there are several ways you can add cool patterns and effects. One of the easiest is to put stickers on the shell before dying, then peel them off after the eggs dry. You can also drip melted wax on the shells if you don't have any stickers handy. For stripes, you can also use electrical tape. You can also give your eggs a unique look with onion skins. Wrap them around raw eggs, using rubber bands to hold them in place, then boil the eggs for about 20 minutes. The oils from the skins will transfer onto the eggs and create a marbled pattern. 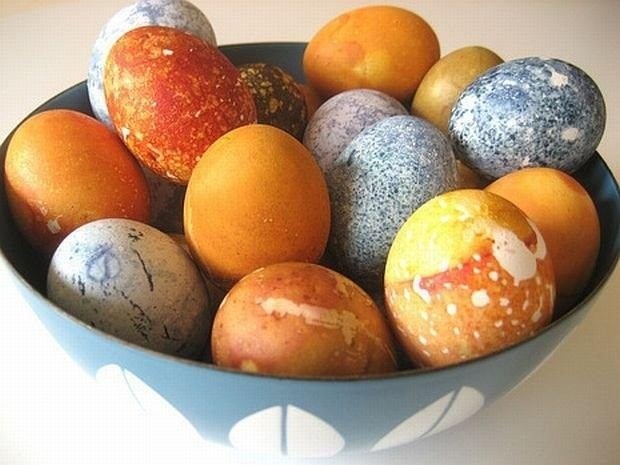 For a much easier speckled look, just add some vegetable oil to the dye before dropping the eggs in. It will coat the shell in some places, preventing the dye from coloring those spots. 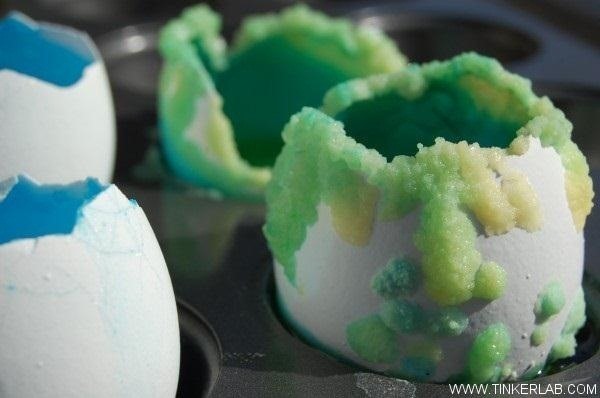 If you really want to go all out, you could try using your homemade dye to make these awesome egg geodes. Check out the video below and tutorial by Curbly for more details and tips on making and using your natural dyes. Want your beautiful creation to last forever? Rather than having to eat or throw out your eggs before they go bad, try blowing out the insides and just dye the empty shell instead. This is a pet hate of mine. Do you know what is made of chemicals? EVERYTHING! You are made up of chemicals, your food is made up of chemicals. If it is matter, then it is a chemical. They are utterly and demonstrably fine.